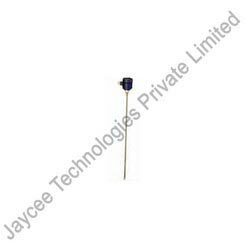 We are the known Manufacturer, Exporter and Supplier of Capacitance Level Transmitters. The Capacitance Level Transmitters are compact, low cost, level transmitter with 4-20 mA analogue out-put designed to measure the level of various liquids, and solid in tanks or storage vessels. Measuring range of Capacitance Level Transmitters is 0.25 to 3 m for rod probe version. The probe of Capacitance Level Transmitters forms an electrical capacitor with the surrounding metal contained wall, or with auxiliary reference probe. With the vessel empty, initial capacitances exists between the electrode and the metal well or the auxiliary reference probe. When the probe become covered with material to be measured the capacitances will increase and the change will be measured and covered into an analogue (4-20 mA) output signal proportional to the change. Rod or flexible cable can be used for various conductive or non-conductive Liquids.